The passport shown here was issued by the Imperial Korean Foreign Office in Seoul on the 27th day of the 3rd month of the 9th year of 光武 (E Kwangmu, F Kwangmon). As a solar date it would be 27 March 1905. As a lunar date it would be a day in April or May. The “data page” to the right is in Chinese. The “message page” to the left is in English and French. The name of the issuing country is 大韓帝國, which in the formally printed English and French translations is rendered “the Empire of Korea” and “l’Empire de Corée”. The name of the bearer was Char Eui Suk, a “gentleman” (紳士) rather than “merchant” (商民), who was traveling to “America” for “travel” (遊歴) rather than “trade” (通商). He is said to have been 15 years of age, which may represent a count of one year at the time he was born. The English describes the bearer as “a native of [locality] in the Empire of Korea” whereas the French says he is a “Citoyen de l’Empire de Corée et natif de la [locality]”. The corresponding Sinific term for “native / natif” is 居 meaning “residing” or “domiciled” in the noted province, city or district, and village. The passport was valid for one year. 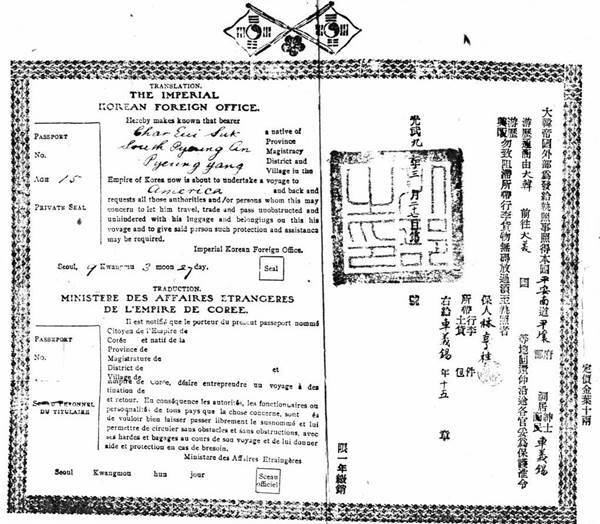 The 1905 passport appears to be designed in the same manner as Japanese passports at the time, which of course were designed in the manner of passports in many other countries. The certificate was folded down the center to make a brochure with the right side as the front cover. A photograph was probably attached to back of left side. Visa and other information stamped or written at various points in transit would also have been on the other side. The passport was issued during the Russo-Japanese War. In 1904, shortly after the war began, Korea had become a protectorate of Japan. Japan had long been involved in governmental reforms in Korea, and Korea had adopted a number of Japanese administrative methods. By the end of 1905, within months after the war, Korea had designated Japan as its proxy in foreign affairs, which meant that Japan oversaw matters the issuing of passports to Koreans and visas to aliens coming to Korea.